Subject: What Is the Internet of Things? It's a term thrown around in a lot of tech stories these days, though it's often not well explained. But the Internet of Things will play a major role in the future of technology. The Internet of Things will literally change how we live. And in the process, it will create countless ways to profit. "Of all the technology trends that are taking place right now, perhaps the biggest one is the Internet of Things; it's the one that's going to give us the most disruption as well as the most opportunity over the next five years," futurist Daniel Burrus wrote on his website last November. 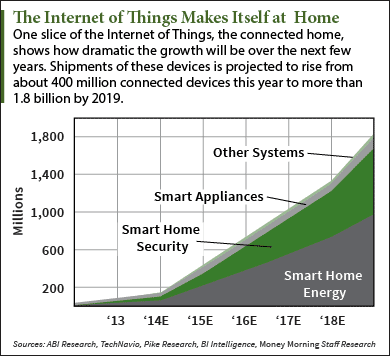 The Internet of Things has only just started to come of age, although the term was coined back in 1999. Intel Corp. (Nasdaq: INTC) projects that the number of connected "things" – which includes everything from objects like appliances and autos to infrastructure like roads and the electrical grid to devices that monitor human health – will rise from 15 billion this year to 200 billion over the next five years alone. Tags: big data, Cloud computing, Internet of Everything, Internet of Things, What is the Internet of Things?